While there are much bolder ways to mix prints, I stuck to a graphic tee and leopard shoes with this outfit. So many people are doing the smoking slipper this season. I adore the Jimmy Choo version, but had already picked up the pair I'm wearing here last year. Bring on the smoking slippers! Everything old is new again, undoubtedly. Ray Ban Wayfarers, Urban Outfitters tee, J Brand pants, Steven by Steve Madden slippers (similar), Marc by Marc Jacobs necklace, Louis Vuitton bracelet, Balenciaga bag. I love your t-shirt so much!! I totally want one like that. And those flats are killer! 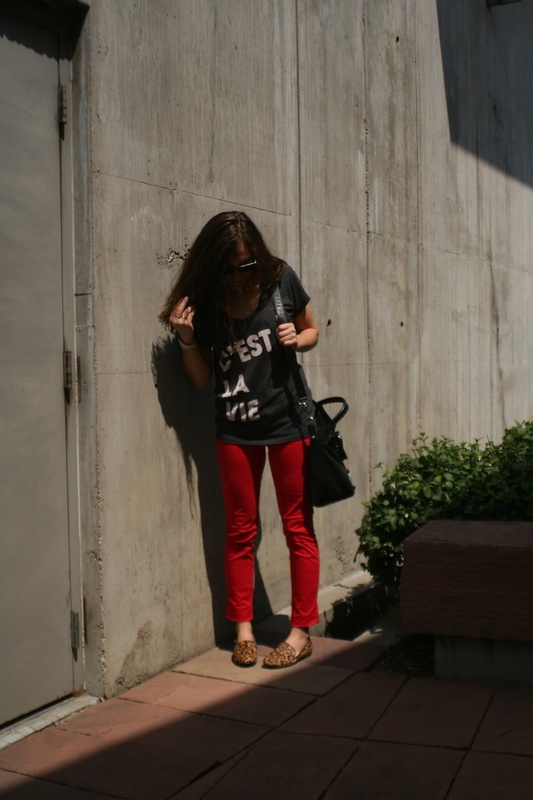 Red pants are so much fun. I wear mine with anything and everything. Me too! It's funny how quickly they've become a closet staple. Love the red pants. I feel like I should get myself a pair! Love the leopard flats too! Thank you! I wear both far more often than I'd ever have imagined. I hope you take the plunge! 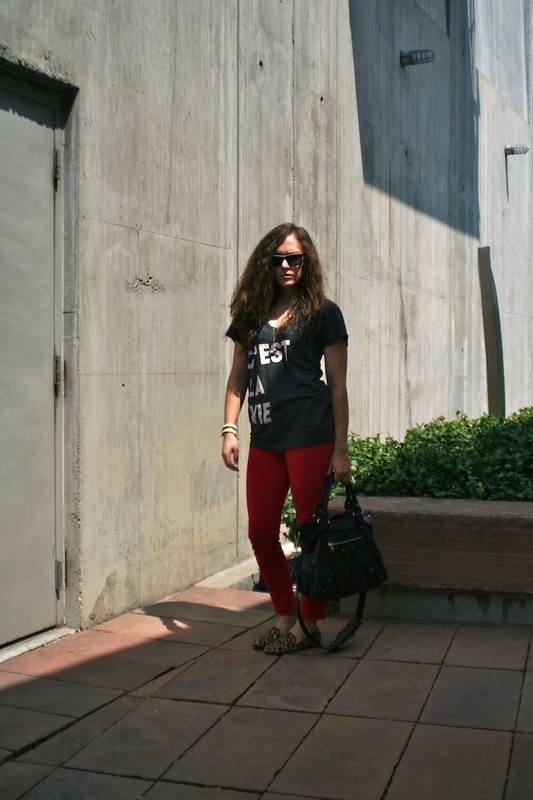 Those red pants are amazing and I LOVE the leopard loafers! I've been wanting a pair for so long and will probably have to give in and buy some this fall! I love your outfit! That shoes are great, and your bag is so lovely! Hey nice blog! follow each other? lve the look u r caring. The bag is a killer piece.. definitely following u now. and hey! I invite u to visit my blog. Do follow if u like it. I'd be real glad. You look great! I love your jeans - I've been looking for a pair for a loooong time. Thank you! I hope you find a pair you love soon! 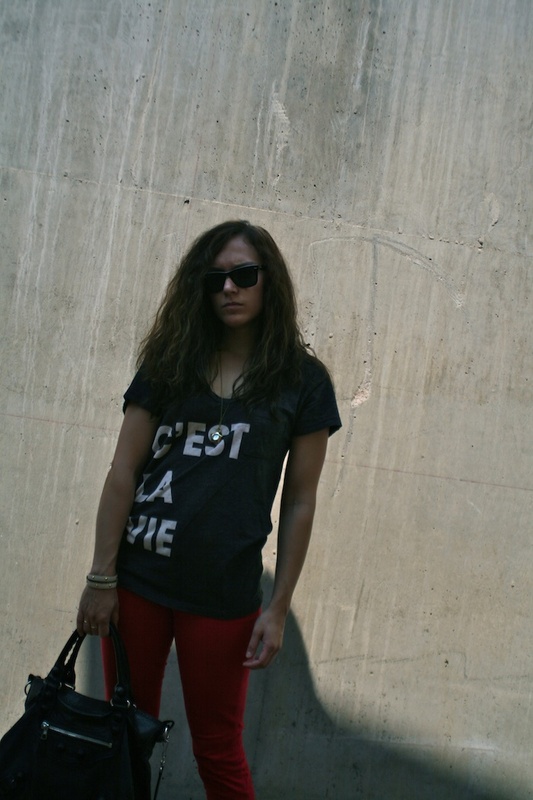 Loving this graphic tee with the hot red skinny jeans! Fabulous look! Thanks for visiting my blog. I follow you now with Bloglovin'. Also can't see you in my GFC list.